Your favorite characters from the movie Shrek now star in an interactive board game. 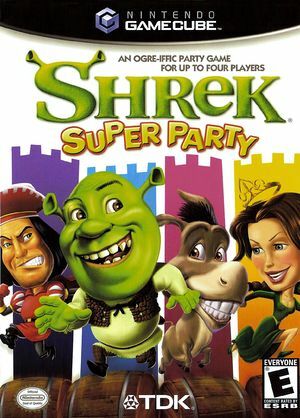 Shrek: Super Party lets you select characters from the movie--including Shrek, Princess Fiona, Lord Farquaad, Donkey, Monsieur Hood, and Thelonius--to battle three of your friends in 30 action-packed minigames. In each game you can earn bug juice, and the first player who earns 100 drops of bug juice wins. Swap bugs, form alliances, or play dirty--but just do whatever you can to gain the competitive edge. The graph below charts the compatibility with Shrek: Super Party since Dolphin's 2.0 release, listing revisions only where a compatibility change occurred. This page was last edited on 1 March 2018, at 08:00.